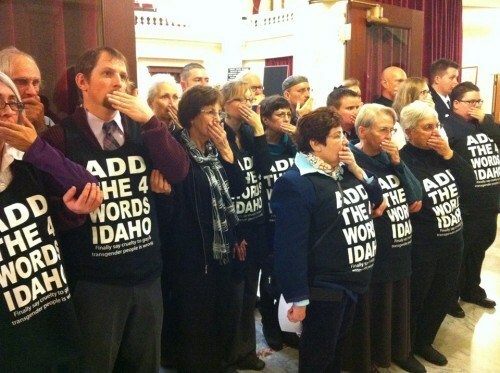 For three hours Monday, a group of forty three Civil Rights activists in black T-shirts, with “Add the 4 Words Idaho” stenciled in white, stood outside the three entrances to the Idaho Senate. In the finest tradition of civil disobedience, they silently protested Idaho lawmakers’ refusal to hold a hearing or even print a bill barring discrimination on the basis of sexual orientation or gender identity. The protesters, who began arriving at 8 a.m., want to amend the Idaho Human Rights Act by adding the four words “sexual orientation” and “gender identity”. The act currently bans discrimination in employment, housing and public accommodations on the basis of race, religion, disability and other factors, but not on sexual orientation or gender identity. The “Add the 4 Words” bill has been proposed for each of the last eight legislative sessions. It has never gotten a full committee hearing. Earlier this session, bill sponsors Sen. Cherie Buckner-Webb and Rep. Grant Burgoyne, both Boise Democrats, announced that were told that they won’t get a hearing this year either. Not being considered in 2014 are fiscally prudent highway investments and Medicaid expansion — which would provide health care for 100,000 low-income Idahoans and save local and state taxpayers hundreds of millions — because GOP lawmakers have decided they need to pass a budget and get home to campaign. The Republican Legislators pretended that they were the victims. The protestors had sullied the dignity of the legislature, and the Republican leaders responded much like they did to the “Occupy Boise” protestors during the last legislative session. In what sounded like a veiled threat, Republican Majority Leader Bart Davis said, “Today, it hurt their cause”. All the protesters were arrested and issued misdemeanor trespass citations. Fortunately, the protestors have plenty of allies including at least a dozen Boise attorneys who have promised to defend them free of charge.